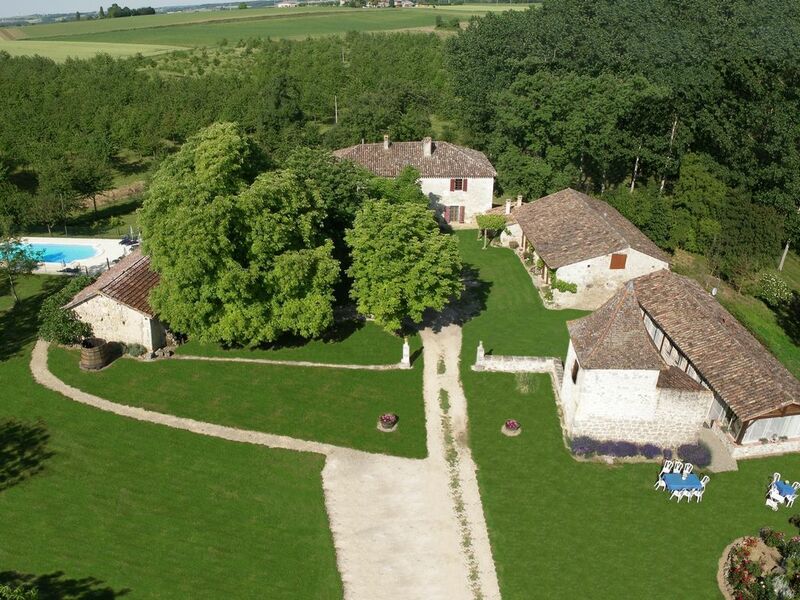 Come relax yourself and forget everything in this haven of peace located in the heart of the Gascony, in the middle of nature (large fenced flowered and wooded ground and vine) with a spacious 14x6 m South-exposed pool that is not overlooked (with parasols and deckchairs) and secured (fence, rolling shutter, approved alarm-fall detector conform to the NF P90 307 standards). In this property with character located 5 km from all amenities (Nérac, marvel of the Pays d’Albret), you will stay in former barns that have been fully renovated in the style of the region (stone and wood) and where some remains have been preserved (bread oven, former sink, farm). In this luxury gîte, composed of 3 bedrooms with 2 90 cm beds (including 1 with shower room and toilet on the first floor), a bathroom, a separate toilet and a large room with the living room, the dining room and the kitchen, you will have the opportunity to recharge your batteries. There is a private terrace and a garden. Washing machine, hand-held tumble dryer, dishwasher, refrigerator, freezer, vacuum cleaner, microwave, electric hobs, extractor hood, toaster, kettle, coffee maker, crockery, etc. Additional tourist tax: from the 1rst of March to the 31th of October / except dispensation. Tourist attractions: “Pehillo” is 3 km from Nérac (Lot-et-Garonne, Aquitaine), marvel of the Pays d’Albret located 30 km from Agen, the capital of the famous prune and also known for its rugby club. The town of Agen is between Bordeaux (135 km and about 1 h20) and Toulouse (120 km and about 1 h40). Homeland of the young Henry IV and called “the small French Tuscany” by Stendhal himself, region of the “bastides”, the department deserves to be better know because it is located between the Périgord, Bordelais, Lot, Landes (15 km) and Gers (15 km) and is inspired by them. Nérac, capital of the good life, region of gastronomy, with the taste of the melon, the aroma of the boletus, the scent of the salmis de palombe and the foie gras that melts in the mouth. The coolness of the medieval streets, the roofs bathed in sunlight with Italian accents, the doors open, welcoming, real local heritage. Located 165 km from Mimizan, the closest beach and 150 km from the Pyrenees. For the summer: barbecue, garden furniture, 2 deckchairs on the terrace and large parasol. The bathroom (on the ground floor courtyard side): white tiled united (with nice frieze), it has a bathtub, a vanity with sink, washing machine and cupboards. It has a dryer towel radiator. The toilets are separated. The separate shower room fitted the third room (the upstairs) is tiled plain white (with nice frieze), equipped with a shower with glazed triple sliding glass door, sink and toilet. We offer you a little necessary maintenance so that you are starting your trip without this concern products, as well as what to feed your first barbecue (charcoal & branches of our vineyard to availability). You can liven up your salads with our homemade wine vinegar. To have a good time, nothing like a little game of bowls on the way to the property or in the courtyard under the shade of chestnut trees! And your children will also enjoy playing with balls made especially for them ... or play a game of Frisbee on the playground ... Needless to overload your vehicle with a bed or chair for your baby, we will pay you with pleasure! And if something was missing from the house (flat or special tool) and we can provide you, we will not hesitate! We will be happy to simplify the stay as much as possible! We have just spent a lovely week at Pehillo with our 5 year old daughter. The gite is not only well furnished and equipped with everything you might need but it has real character : stone walls, a lovely patio area with a table and fully equipped BBQ and is fully private from next door. The location is super - within own woods with hares, deers and squirrels and surrounded by farmland of fields of sunflowers and yet the 'royal" town of Nerac is but 4km away for daily croissants and pains au chocolat. This was a pleasant surprise as we had booked on the strength of the gite itself but Nerac is a lovely French town with a rich history having played an important role in the life of Henry of Navarre who became Henri IV of France. Other villages around were a delight - easy , stress free sightseeing or attending the markets or local restaurants. Our daughter delighted in the excellent swimming pool and the chance to meet another family next door as well as the nature walks and the night walk when we heard a Long eared owl at close quarters. Sonia and Michel have obviously put a lot of work into making this a memorable and easy place to stay - welcome drinks on the first night set the holiday off perfectly and always on hand for local advice if needed. Highly recommended. Thank you very much for your comments, and all the details you give about the property and all over .... We are very happy you could take advantage of all while your stay this summer, and appréciate it ! Thank you also for your kindness and sweetness on the spot... See you soon by pleasure, with your family ! Nous avons adoré notre séjour à Péhillo ! Tout était parfait : l'accueil de nos hôtes Sonia et Michel qui nous ont guidé et raconté avec passion l'histoire du lieu. Nous avons pu ainsi découvrir les alentours de Nérac et apprécier les marchés locaux et les fêtes locales avec des gens formidables. Le lieu invite à la détente et nous avons pu ainsi profiter pleinement du séjour avec nos amis. Nous ne sommes pas prêt d'oublier les sourires et la bonne humeur de Michel et Sonia et avons hâte de les retrouver à Péhillo ! Ce fut une excellente quinzaine pour nous aussi ! Vous n'étiez pas en reste côté sourires, et nous avons grandement apprécié votre présence pleine de joie ! Nous vous en remercions chaleureusement, et espérons très sincèrement avoir la chance de vous accueillir à nouveau prochainement à Pehillo ! Pensez à réserver à l'avance si vous voulez être sûrs d'avoir une quinzaine aux périodes les plus prisées ... ! A bientôt peut-être, mais avec grand plaisir assurément ! Notre (trop )court séjour nous a permis d'apprécier la quiétude des lieux. Nous nous sommes tout de suite sentis très bien dans ce vaste domaine parfaitement entretenu. Merci pour l'accueil chaleureux , la gentillesse et les précieux conseils de nos hôtes . FOR-MI-DA-BLE séjour en famille ! vos sentiments nous vont droit au coeur, merci beaucoup de les avoir exprimés en ces termes. Nous-même avons grandement apprécié les 3 semaines durant lesquelles vous avez été présent sur le site, avec votre sympathique famille, que nous saluons sincèrement elle aussi. Les "pupus" (ou huppes faciées) sont désormais repartis, comme chaque année (nous les reverrons au printemps prochain) mais les souvenirs de nos hôtes eux, perdurent bien au delà des saisons, et vous y figurerez en bonne place, soyez en sûr ! Nos Amitiés à tous, et au plaisir de vous revoir un jour ! Accueil charmant et souriant , donnant un réel sentiment de chaleur humaine et de gentillesse, jamais démenti . Prévenance sans faille, très à l'écoute des pensionnaires. Gîte au décor familiale très agréable. Avec une nature présente, sans pour autant être eloigné des commodités commerciales indispensable (hypermarchés proches, centre ville à découvrir, marché aux nombreux produits régionaux ) si vous y projetez un séjour, n'hésitez pas aucune mauvaise surprise à craindre. Merci beaucoup à vous pour votre présence agréable et néanmoins fort discrète pendant ces 8 jours. Nous serons ravis de vous accueillir à nouveau avec vos 4 charmantes filles ! A très bientôt ! Accueil chaleureux et disponibilité parfaite des hôtes entièrement dévoués à leurs visiteurs. Propreté impeccable des lieux avec moult attentions délicates. Domaine magnifique et parc remarquablement entretenu. Mille mercis pour ce résumé concernant ...notre conception d'un séjour réussi, tout simplement. Nous sommes ravis que tout cela corresponde à vos attentes, et tenterons de faire encore mieux lors de votre prochaine venue. Dans l'attente, encore merci à vous d'avoir su apprecier les charmes de Pehillo ! “Pehillo” is 4 km from Nérac (Lot-et-Garonne, Aquitaine), marvel of the Pays d’Albret located 30 km from Agen, the capital of the famous prune and also known for its rugby club. Nérac, capital of the good life, region of gastronomy, with the taste of the melon, the aroma of the boletus, the scent of the “salmis de palombe” and the foie gras that melts in the mouth. The coolness of the medieval streets, the roofs bathed in sunlight with Italian accents, the doors open, welcoming, real local heritage. Located 165 km from Mimizan, the closest beach and 150 km from the Pyrenees. Animaux non admis (aucune dérogation), même avec supplément. > Le ménage est inclus dans la prestation à la nuitée, mais homelidays ne distingue pas nuitée et semaine, d'où quelques fois des différences ...Toutes nos excuses si le cas se produit...et n'hésitez pas à nous le faire savoir. > Tarifs dégressifs, et différents selon si linge inclus ou non : plus simple de nous consulter www.pehillo.info ... > Linge non inclus dans notre tarif nuitée sur Abritel : en supplément à régler sur place (forfait de 30 € max / nuit selon formule). A partir de 6 nuitées (ce nombre étant considéré comme 1 semaine, le tarif étant à votre avantage) : 7,50 € / personne / semaine pour les draps; 3 € / personne / semaine pour les serviettes. Possibilité d'apporter son propre linge (serviettes et/ou draps). > Supplément chauffage (seulement si besoin, donc pas indiqué dans les frais, car Homelidays le facture alors systématiquement) et compté uniquement en basse saison; à régler au moment du départ (8 €/ nuitée; 50 €/ sem; inclus au mois); > Caution demandée (mais non encaissée, sauf casse ou dégradation éventuelle): de 300 à 500 € selon saison et capacité (1 à 3 chambres). > Acompte à la réservation; > Tarifs / gîte de 1 à 3 chambres / semaine, à partir de : Basse saison : de 230 € à 420 €, Moyenne saison : de 280 € à 600 €, > Tarifs / gîte avec 3 chambres, à partir de : Haute saison : 930 € Très haute saison : 1050 € >Hors été : Possibilité de nuitée : de 55 € à 210 € selon la capacité et si le linge est fourni ou non Jour d'arrivée et durée de séjour sans importance; Possibilité de tarif au mois (de 500 à 900 € / mois selon le nombre de chambres mises à disposition) ; Tarif personnalisé pour gîte avec seulement 1 ou 2 chambres, la (ou les) chambre(s) restante(s) étant alors condamnée(s). Demandez-nous un devis personnalisé ... ou rendez-vous sur notre site www.pehillo.info pour plus de détails.